Since we have been attending antique tractor shows, we have wanted to mount a plow to the Newgren lift. 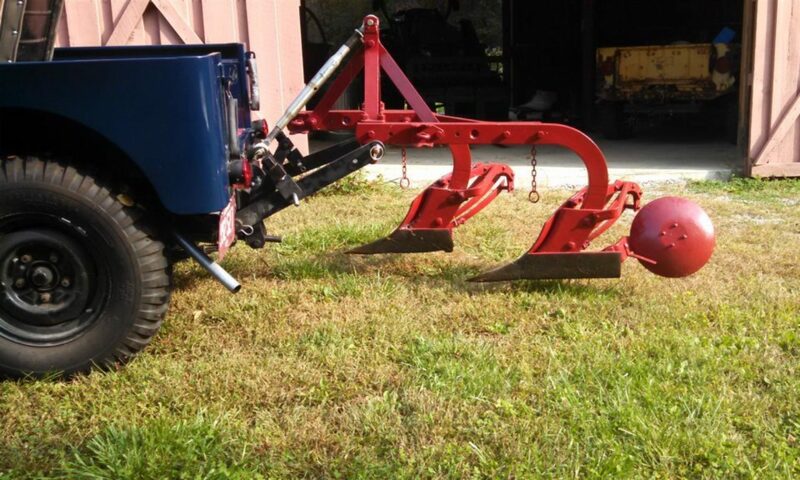 At a show last May, our friend Craig loaned us his Newgren plow and it was a hit. It did appear that folks who had never encountered a farm jeep had trouble completely grasping the concept without an implement hanging off the back. Seeing the plow back there drew a larger crowd. 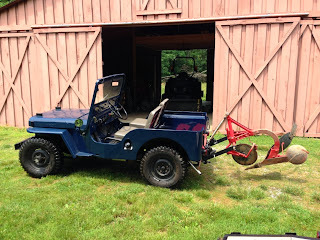 While we have 3 plows on the farm – a Ford Dearborn 2-14, a Massey-Ferguson 1-16 and a Wiard 2-12, none of these seemed to work correctly (not enough ground clearance for transportation) with the Newgren lift. Luckily are search for plow information led us to Clint Dixon who has helped us find specifications for the operation of our lift, as well as lessons in plow geometry. Over the weekend, I got the Newgren lift working and tried to see how it would do with my 3 plows. All have tall masts, but wanted to see if one might work as a “show with the jeep” plow. I hoped the Wiard would work, but no luck. Then tried a Dearborn 2-14 and a MF 1-16. The 1-16 came close, but was only a couple of inches off the ground. So I’m going to build some pin-on adapters for the Newgren arms that will allow me to lift the plows high enough for transport, even if not for actual field work. I’ll continue my search for an early Newgren plow. It is not the mast height, but the ground to pin height on the plow that is the problem. Don’t know if there are any other any commercial plows that would fit the Newgren lift, unmodified. Well, this one took some thought and some research. From Willys literature from 1951, I see that the Monroe Lift mounted on a Jeep Universal equipped with 7:00×15 tires, heavy springs, and a 180 lb. operator allows the Lower Hitch Points to lower to a height of 7-inches above the ground – well below the ASAE standard. It also allows the Lower Hitch Points to raise to a height of 32-7/8 inches above the ground – just meeting the ASAE requirement. The Monroe Lift mounted on my Dodge Power Wagon allows the Lower Hitch Points to lower to 7-1/2 inches from the ground and raise to 32-1/2 inches. Again, meeting the ASAE standards. I have never had the chance to compare these dimensions to a Newgren Lift mounted on a Jeep. I have to imagine the dimensions would be close if J.B. Love was trying to meet the Category I standards. If they deviate to any great degree, this could definitely contribute to what you have experienced. I measured the distances from the ground to the center of the rockshaft on my Newgren plows, each having the tall masts. The dimension varies slightly depending upon the type of plowshares and how much they are worn, but 21-1/2 inches is an average. I do not have a Wiard, Dearborn, or Massey Ferguson near to measure, but I suspect the dimensions would not vary by more than an inch. I do not know how this dimension compares to an early short-masted Newgren. This 21-1/2 inch measurement as taken with the plow sitting on the ground allows the plow to lower up to 14-inches into the ground. As a general rule, a 16-inch plow will work best when plowing an 8-inch deep furrow, a 14-inch plow at 7-inchs, and a 12-inch plow at a 6-inch furrow. This gives us a reserve of 6 to 8 inches of available additional plow working depth in the ground. This can be valuable when the front wheels of the vehicle pass through a washout or low spot. They can drop quite a bit before the plow is actually pulled from the ground. This 21-1/2 inch rockshaft-to-ground measurement also means that the plow should lift high enough that the plowshare points will be about 10 to 11-inches above the ground during transport (not taking into account suspension squat from the extra weight). This is about where the plows lift to on my Power Wagon. An early Newgren plow, with the short mast height, will no longer be parallel to the ground when raised to transport position with a Newgren Lift. The tail should be slightly high, but this has no real effect on overall ground clearance. A later Newgren plow, with the tall mast height, will be at approximately the same angle to the ground when raised to transport position with a Monroe Lift. The same thing happens with Dearborn and Ferguson plows on Ford and Ferguson tractors, and Dearborn and Ferguson plows on vehicles with Monroe Lifts. Could anything be bent on your lift? Or, do you not have original lower links and yours may be too short? I do not have the dimensions, but I could maybe get them for you. Are you sure you are getting full stroke out of the cylinder? Is the pump maybe loosing pressure before the cylinder is completely extended? I am not aware of any plows other than what you have that would work better. I am interested to hear what you find out. Thank you for this great information. The lower arms and the adjustment links are reproductions on the lift. It is possible that they are not the proper length. I’ll try to take some measurements of the lift range and see where I’m at now. I had to have the cylinder complete rebuild, with a new body. The shop reused the end caps and the end section of the rod, but I can’t be sure it was done to original specs. I’m not sure how to thank you for taking the time to research this. You have saved me hours of chasing the wrong issue. I’ll keep you informed of my progress. Well it took a while but I got some dimensions for you. The original arms on a Newgren lift measure 21-1/2 inches, centerline to centerline, from the hole where the lift arm mounts to the rockshaft to the hole where the implement attaches. The lift arms measure 1 inch thick and 2-1/2 inches wide. With the arms fully lifted, the measurement from the hole where the implement attaches to the ground is approximately 27 inches (depending upon tire condition, rear suspension condition, etc. of course). The amount of shaft that sticks out beyond the pivot block under the rockshaft is 3-1/2 inches. With the lift fully lowered, you can manually raise the lift arms, but the 3-1/2 inches of shaft will never pull out of the pivot block. I do not know for sure, but I suspect, if you had an early short mast Newgren plow and a later tall mast Newgren plow sitting next to each other, the implement attaching points on the early plow would be a little closer to the ground than the implement attaching points on the later Newgren. The measurements match to what we have, for both the arm length/size and for the lift range (we did get 28″ by screwing the adjusters all the way up). So we are on the lookout for a plow. The good news is that we know we have the correct setup. Need to continue looking for an original Newgren plow. However, we may need to change our description of the Newgren lift as be compatible with standard 3PT implements. Previous PostPrevious Wow! 10 months has seen a lot happening in the Farm Jeep garage!